One of Rolex’s trademarks, literally and figuratively is the Rolex crown. The five pointed Rolex crown logo is recognized around the globe, but what many people do not realize that what also sets a Rolex apart is the winding crown. A critical part in keeping a Rolex Oyster case water tight is the winding crown. Prior to the 1920’s, mechanical wristwatches tended to leak when they came in contact with water. In 1926 Hans Wilsdorf, Rolex founder patented a winding crown that screwed into the case and onto a rubber gasket created a hermitic seal that resisted water under pressure. Combined with the screw-in caseback of the Oyster case, the Achilles heel of any watch was now water and pressure resistant. Mercedes Glietze proved a Rolex’s water ruggedness in her English Channel swim in 1927. Unlike winding crown of the time that just popped in an out to wind and set the time, a Rolex crown threaded onto a case tube that was in-turn threaded into the case. The Rolex case tube was threaded and screwed into the watch case and kept water tight with a zytel seal, – a seal material similar to what is used to keep the crystal water tight. When it comes to Rolex winding crowns, there are two main types: the TwinLock and the TripLock. 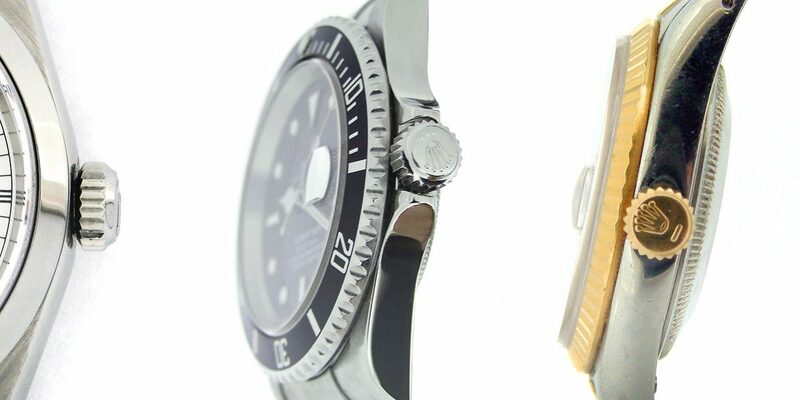 TwinLock Crowns are typically found in Rolex watches primarily designed for uses other than going underwater. Twinlock Crowns are identified by a one or two dots, or a flat line underneath the Rolex five pointed crown logo. The Twinlock crown is rated to 100m because they have two rubber o-ring seals; one around the stem and one located inside the crown. 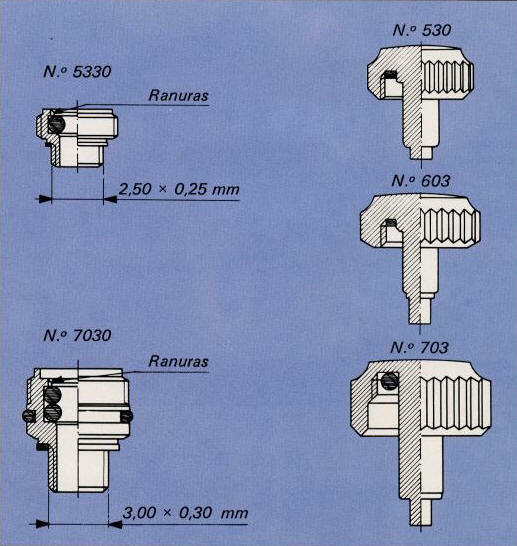 The Rolex TripLock crowns utilize four o-ring seals and are rated for 300m. TripLock crowns are found on all Rolex diving watches and on some non-water bound watches such as the Rolex Daytona, Yachtmasters, and GMT-II. Like the TwinLock crown, the TripLock crown has an o-ring inside the crown and the winding stem, but also has a additional o-rings on the winding stem (for a total of two on the winding stem) and one around the case tube for a total of four o-ring seals. 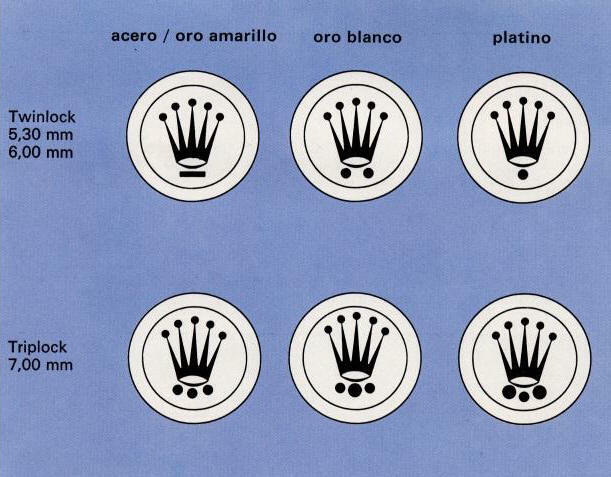 The TripLock crowns are readily identifiable as they are typically wider and larger to accommodate the extra o-rings, and have three dots under the Rolex five-pointed crown logo. The Rolex Crown literally and figuratively is one of the many developments that sets Rolex apart.